Ozzy Osbourne's debut solo album, 1980's "Blizzard Of Ozz", has been certified quintuple platinum in the U.S. by the RIAA (Recording Industry Association of America) after accumulating five million certified units. The February 4 recognition comes more than two decades since the LP was certified quadruple platinum (August 15, 1997). Also certified on February 4 was Ozzy's 2003 greatest-hits album, "The Essential Ozzy Osbourne", which went double platinum after accumulating two million certified units. That collection was previously certified platinum on March 3, 2016. "Blizzard Of Ozz" was reissued in 2011 in a definitive edition that restored and remastered the original recordings. It was made available separately or as part of a deluxe box set with 1981's "Diary Of A Madman" that featured both albums on CD and vinyl, a 100-page coffee table book, a documentary on DVD and a "full-size detailed replica of Ozzy's iconic cross." 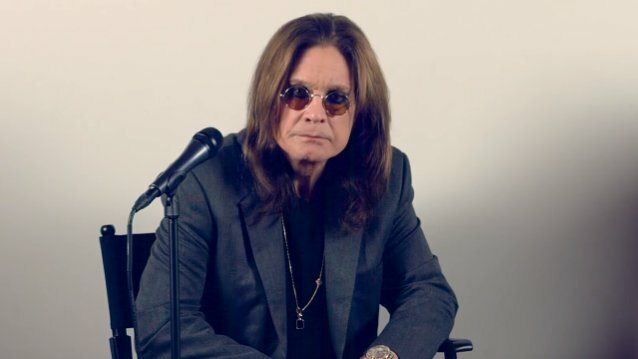 The two albums were recorded soon after Ozzy was booted from BLACK SABBATH and marked his brief but legendary collaboration with late guitar hero Randy Rhoads. Ozzy told The Pulse Of Radio that he thought he had a winning combination on his hands. "You kind of know, but then again you don't know, because I mean, you're treading on new territory," he said. "And being as I had been fired from BLACK SABBATH, there was a lot of rivalry between them and me. I had everything to gain and nothing to lose, you know." The albums restored the bass and drum tracks played respectively by Bob Daisley and Lee Kerslake, which were controversially removed for a 2002 reissue by Ozzy's wife and manager Sharon over a royalties dispute. The "Blizzard Of Ozz" reissue came with three bonus studio tracks, including an alternate version of "Goodbye To Romance" and a song never previously released in the U.S. called "You Looking At Me, Looking At You".